Available in several sizes, this convenient wall access panel offers an attractive alternative to conventional panel covers or costly wall and ceiling refinishing in new and retrofit installation situations. 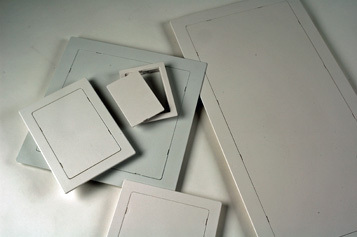 Simply cut a hole to the panel frame size and mount the access panel in a flush mount or surface mount configuration. Fabricated from durable, non-conductive, high-impact ABS plastic. Pop-out door provides quick, easy access and provides professional off-white standard textured finish. Panel can be painted, tiled or wall-papered for a custom finish.